When it comes to social media, subtitles increase audience engagement. 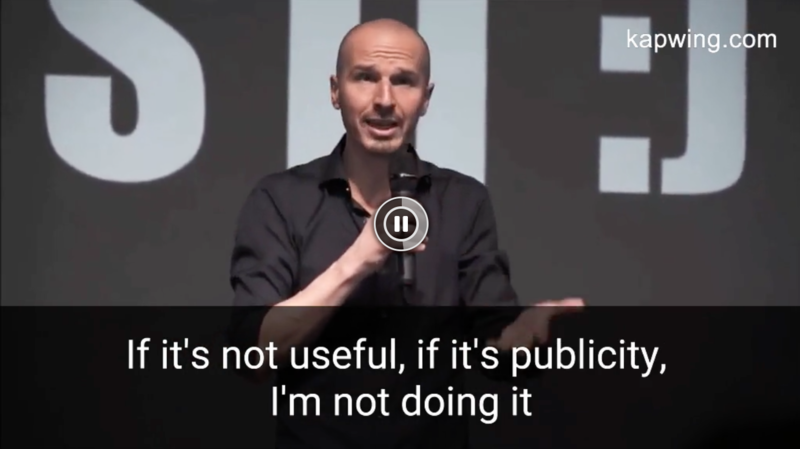 If you’re building your professional following and personal brand using videos on LinkedIn, you should add subtitles directly to your video so that you don’t rely on audio to communicate your story. In this post, I’ll describe how you can quickly add subtitles to LinkedIn video using a free online tool called Kapwing. In August 2017, LinkedIn started supporting video uploads. Users can create and share professional video content like customer testimonials, team culture insights, demos, vlogs, or thought leadership with their network. More recently, LinkedIn businesses can sponsor video ads that appears in the newsfeed and post videos on their LinkedIn company page. Some people like Dennis at Linked Superpowers have built businesses around LinkedIn content strategy. Accessibility: Your message will reach people who have hearing impairments or who are watching the video without sound. Unlike YouTube, LinkedIn does not have an automatic subtitling solution, meaning you need to embed text directly (called “open captions”) to make your videos more accessible. Engagement: Like Facebook and Snap, most mobile users watch videos with the sound turned off. 57% of LinkedIn users browse their feed on a mobile device, and 85% of people on mobile watch social media muted. A study by Instapage showed that, on Facebook, subtitled videos had significantly higher click-through and share rate than videos without subtitles. Embedding text gives the user immediate context as to the video’s topic, adding “thumb-stopping” appeal. Clarity: Your viewers are more likely to remember your message if they can hear it and see it. Subtitles compensate for background noise, unfamiliar accents, and words that trail off. Kapwing’s tools are self-explanatory, so you should be able to go to Kapwing’s subtitle maker and know what to do. 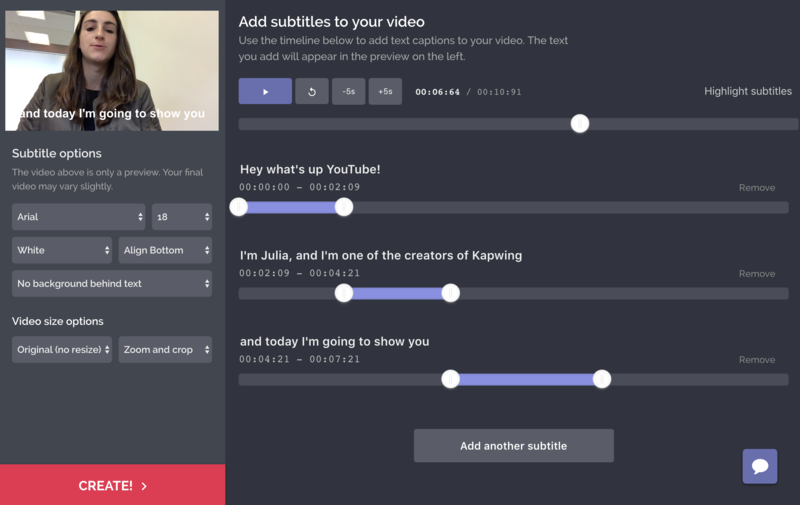 If you prefer, there are also several YouTube tutorials about using Kapwing’s Subtitle Maker. 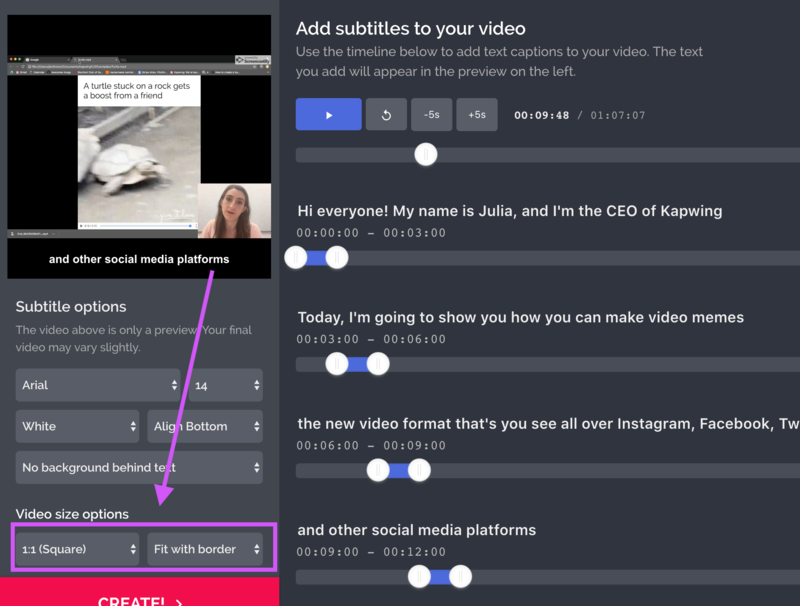 Step 1: Upload your video to Kapwing Open Kapwing’s free Subtitle Maker by navigating to Kapwing.com/subtitles. Kapwing is a free, online video editor, so you won’t need to install any software and you can access it from any device. If you use the free version, your output video will have a small watermark in the corner of the video. Step 2: Transcribe your video and time out the subtitles Listen to the video and type out the audio. Then, time the subtitles so they match up with the voice in the video. Step 3: Style your subtitles You can embed the subtitles directly into the video, add a semi-opaque background behind the text, or add the subtitles in a rectangle below the video. To make your video square with the subtitles showing below, adjust the size options and fit options so that the text has padding behind it. Kapwing also gives you the option to change the subtitle’s color, font, and text size. You can align the text above or below the video. Step 4: Download the output and upload to LinkedIn Once you’re happy with the video preview on the left panel, click ‘Create’ to process your subtitled video. Kapwing is a cloud platform, so all of the processing happens remotely. After the video has processed, download the video to share. Publish the mp4 file on LinkedIn by clicking the share video workflow on the Home feed.